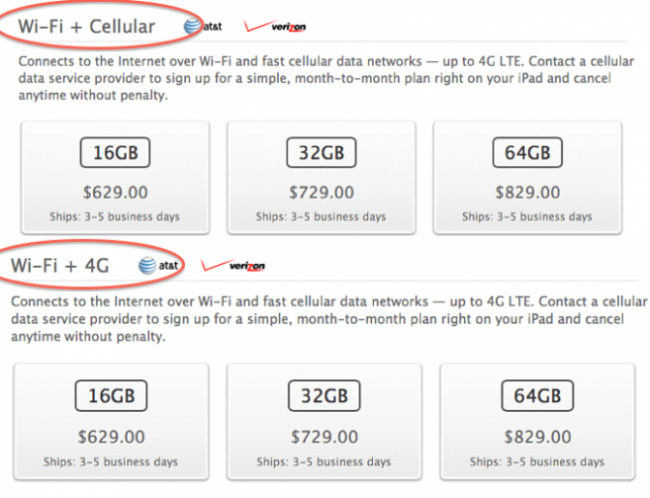 Apple has changed the name of the 4G version of the iPad to iPad WiFi + Cellular. The ‘Cellular’ has been added and replaced the 4G. Nothing has actually changed in the iPad and this is merely to keep a number of countries happy who were complaining that they were buying a 4G device in a country where 4G wasn’t available… ie, they couldn’t get the full benefit of it. The previous generation iPad, the iPad 2, will still be known as the iPad 2 WiFi + 3G as 3G is available in the countries that it is available. 4G LTE is currently only available in the US and Canada as well as only being on 5 carriers. Other countries do support faster speeds although some are not fully compatible and the iPad cannot connect at the top speeds. The name change is the final part which helps avoid confusion.